It felt natural using the trackball except for the right and left click buttons that felt too far way from the centre of the device. Resting my palm on it also felt good without and strain on my wrist. I use this with a regular mouse. Pros: scroll ring, good for both hands, rubber wrist rest. great mouse, love the scroll ring (wasn't sure about it before ordering), very accurate track ball and no issues clicking and draging, etc. both buttons on the sides could be moved a bit closer as i'm just able to reach the right side with my thumb, but not really a problem. so far, i'm happy with it. Cons: Scroll wheel seem a bit loose.Only 2 buttons. Pros: Comfortable design (compared to the other trackballs I've used).Relatively Cheap (when on sale). I've tried a few different trackballs previously but found them difficult to use for various reasons. I was immediately comfortable using this trackball and quickly became proficient with it. one of the few remaining trackballs out there. It is comfortable in the hand and has a convenient scroll wheel. I recommend for two ends of a spectrum, the new (senior) user of a computer and an intense gamer. The trackball doesnt jump or have sudden movement that throws off the senior computer user when trying to double click. For gamers, it has true stop accuracy, so you don't have to worry about your targeting sight "drifting" because of slight hand movements.And this is one of the few trackballs left, so if you are a fan of that mouse style you may want to get it while you can. This is a good scrollball, better than almost all with the exception of the expensive kensington (I assume). Works great for people with slow hands like my grandparents, since it is not possible to move the ball when clicking (but a mouse can move when trying to click). However if you are a caffeinated user and are aggressive with it, it may not be ideal. I found that I would tend to pick up the ball a bit sometimes, grabbing it from the sides and spinning it around- then the ball kind of jumps a few millimeters since its not securely locked down. Its meant for scrolling from the top, then it doesn't jump. 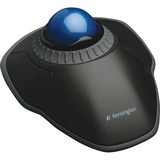 Quickly and easily navigate through web pages and documents with this trackball that features a scroll ring. Ambidextrous design delivers all-day comfort to either hand. Optical technology provides you with precise tracking. Customize buttons with TrackballWorks? software. Includes detachable wrist rest.